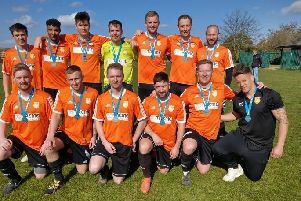 Last season's ChromaSports League Shield winners FC Peterborough. There are only two first-round ties in the Peterborough League’s President’s Shield this season. Whittlesey Athletic will host Peterborough Sports Reserves, while Langtoft will entertain Deeping Reserves. Other draws: Chairman’s Shield: Stamford Lions v Spalding United Res, Oundle v Wittering, Baston v ICA B, Langtoft Rese v Sutton Bridge, Long Sutton v King’s Cliffe, Stamford Bels v Wisbech Res, Whittlesey Athletic Res, Warboys v Moulton Harrox Res. Intermediate Shield: Stilton Res v Crowland Res, Ketton Res v Bretton NE, Eye v Parkway Eagles, Pinchbeck Res v Stanground Sports, Glinton & Northborough v Ramsey, Thorpe Wood Rangers v Leverington Res, Guyhirn c ICA Sports A, Uppingham Res v Stamford Lions Res, Riverside Res v Sawtry Res, Oundle Res v Farcet, Spalding Town v Netherton A, Thorney Res v Hampton, Whittlesey Athletic A v Oakham Res. League Shield: Sutton Bridge Res v Whaplode Drove , Rutland DR v Parkside, Limetree v Brotherhoods, Stanground Res v KRC Deeping, Stanground Sports Res v Holbeach A, Holbeach Bank v FC Peterborough, Leverington A v Harrowby, Feeder v Stamford Bels Res.